Arabella Steinbacher’s soulmate has been with her since birth. Her father, a solo répétiteur with the Bavarian State Opera, found Richard Strauss to be one of his favorite composers, so much so that their daughter was named after the name of the 1933 lyrical comedy. Arabella Steinbacher has been playing violin since the age of three, and not only has she followed in her father’s footsteps of Strauss devotion, she’s also opened her repertoire to feature a wide range of modern concerto works. Amassing 17 albums of diversité musicale gives a turnaround to Richard Strauss and the contents herein. 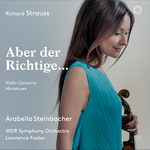 It’s the lovely Arabella/Zdenka duet, “Aber der Richtige”, from Arabella which prompted the violinist to focus on an exclusive Strauss CD. Lesser-known works that build into the body’s release by substituting voice, piano and cello as “serendipitous exchanges” will appeal to well-satisfied Straussian lovers in search of broadened horizons. Mlle Steinbacher opens with the Violin Concerto, a virtuosic piece since Richard Strauss composed this at the young age of 17. The soloist’s detail has a esprit d’indépendance with horns that delicately trim in the framework. Mendelssohnian in flair, the conclusive “Rondo” [ref: “Tarantella”] finds Arabella Steinbacher preciously touchy and lightly spirited while yellow canary flutes chirp away. The luscious, at times masculine, Romanze is one of the most gorgeous translations, shunting cello for violin. Mlle Steinbacher currently plays a 1716 “Booth” Stradivari which may explain why the vibrancy and the tone is so warm and benevolent. Flowing inside and outside of legato curves, the piece clearly anticipates Der Rosenkavalier with bits of minuet detailing. So taken by the Little Scherzino and “Aber der Richtige”, the violinist turned to Hungarian Peter von Wienhardt to rearrange these pieces and enable her to blossom with self-expression through improvisation and meter adjustments. While Arabella Steinbacher’s skittering lightness prevails inside the opus 3 œuvre, the composition also hints at Pauline’s rudimentary nagging as is found in Strauss’ later work, Intermezzo. Mlle Steinbacher’s most memorable composition is saved for last. This passionate delivery has a logical transposition from voice to strings and the feeling can be felt in every fiber of her strings. The treasure is for us to hear, but the treasure is for her to keep. The remaining four “Miniatures” are all jewels. Though differing in moods, the most moving dwells inside the “Traum durch die Dämmerung” and the berceuse, “Wiegenlied.” Yet the “Cäcilie” has the most dramatic of foundation. Originally scored for voice, Arabella Steinbacher utilizes grand, sweeping lines since Strauss wrote the piece the day before his wedding to Pauline de Ahna in 1894. In her forward Mlle Steinbacher is quoted: “...even if the sung lyrics are missing, I have dared to sing these songs on my violin and hope that singers will forgive me.” The substance of her statement exemplifies her humbleness, that she believes in transferring voice for strings for the Arabella duet and the “Miniatures” since much is to be considered by way of emotional beauty. Furthermore, as an acting CARE ambassador, Arabella Steinbacher’s outreach into the world community, particularly during her Japan Tour (initiated in response to the country’s catastrophic tsunami in 2011) demonstrates her depth of compassion and sincerity which assists her strength at the bow and a musical panacea. Richard Strauss’ iridescent music has the flexibility to venture forth, to share and to explore. Arabella Steinbacher broadens our knowledge of Richard Strauss within this suasive performance.